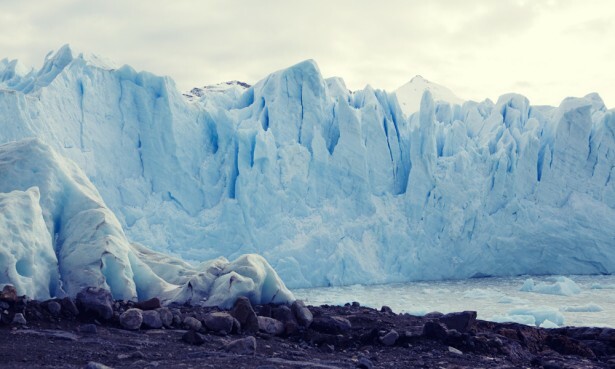 Seeing the Perito Moreno glacier was one of the most hyped moments we dreamed of when planning this trip – so much so that as the day approached we started to panic that we may have built it up a little too much. We needn’t have worried as the ice giant went beyond expectations. 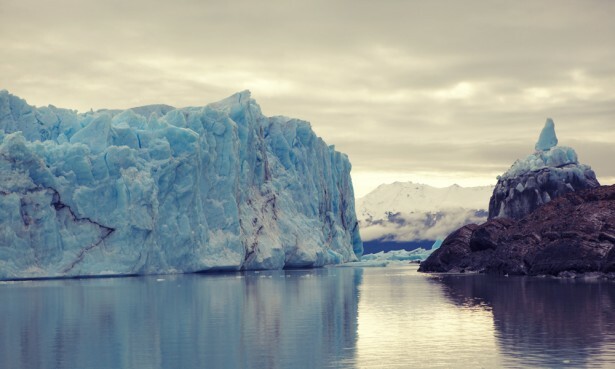 While most glaciers are receding, Perito Moreno is considered stable and is constantly advancing, moving up to two metres every day. This means that, if you’re lucky, you can see and hear huge parts of it cracking off into the water below. We were excited enough to see the glacier but, when we heard it, our awe was taken to humbleness. It took our breath away every time it thundered and broke – sounding like a thunderstorm and fireworks display rolled into one. When, over time, the glacier hits the opposing land, it forms a natural dam that causes the river to rise by up to 30 metres. 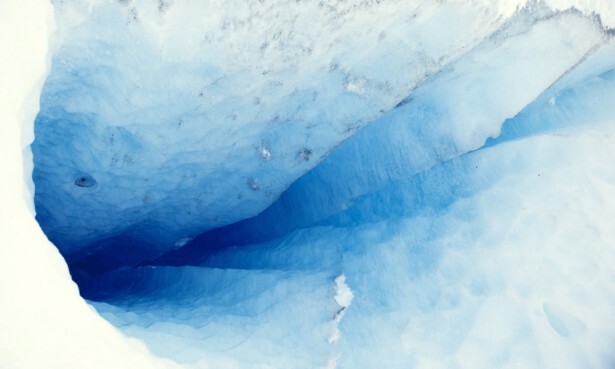 In March, the dammed water pressured through the ice, causing a massive area to crumble and fall. It’s an event that happens only every five years or so, and people were eagerly waiting to catch a glimpse of the spectacular collapse. It eventually happened in the dead of night when the park was closed and no-one was there to catch it on camera apart from a caretaker who, in their excitement, managed to catch no more than a blur. One thing we hadn’t thought about before visiting the glacier was how beautiful the area surrounding it would be. ….which looked incredible against the colourful rocks and autumnal trees. 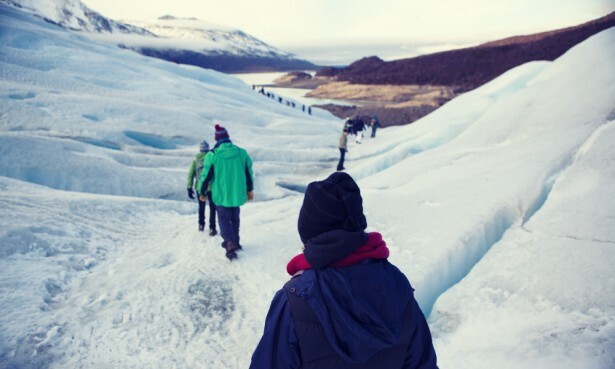 One of the highlights of the trip was doing a mini ice trek on the glacier. We debated it a beforehand as it was quite expensive at $550 pesos, but it was definitely worth it. 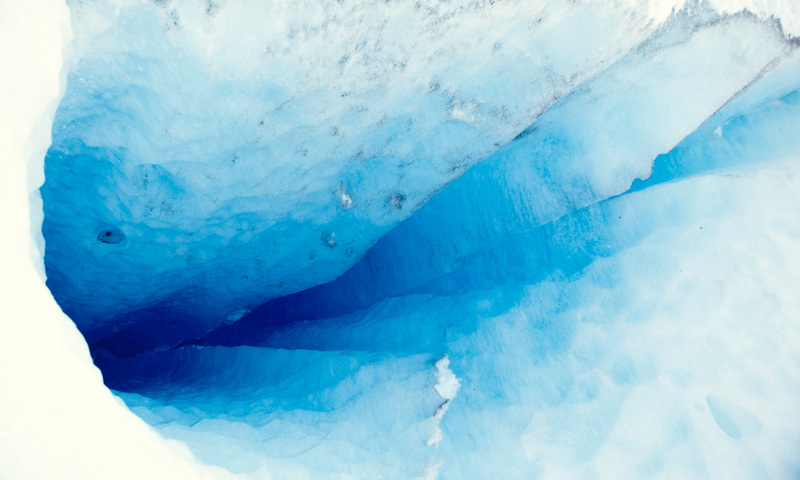 We spent about two hours walking on the ice, complete with crampons and knowledgeable guides who told us about the glacier’s formation. From afar, we wondered how we were going to walk on such a jagged surface, but up close it was much smoother, and we soon got the hang of walking up and down steep inclines. There were some pretty treacherous areas near deep ice pools but we felt in safe hands with our two guides. 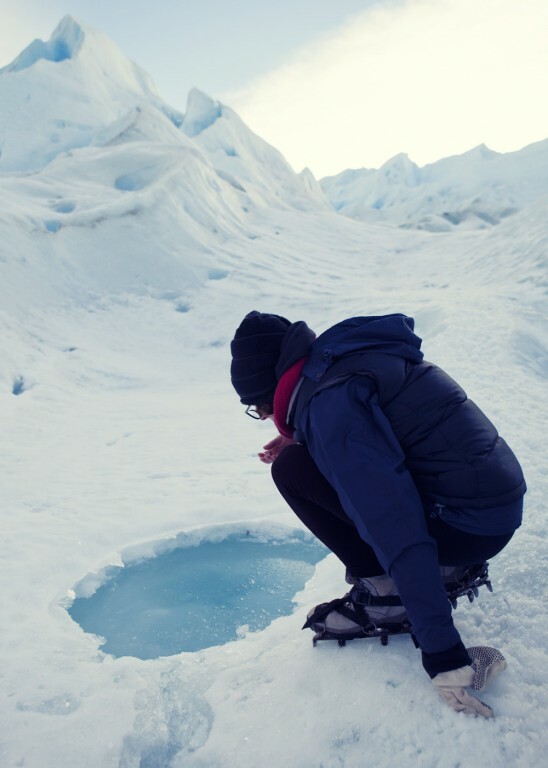 You could even drink the glacier, at small pools along the way. 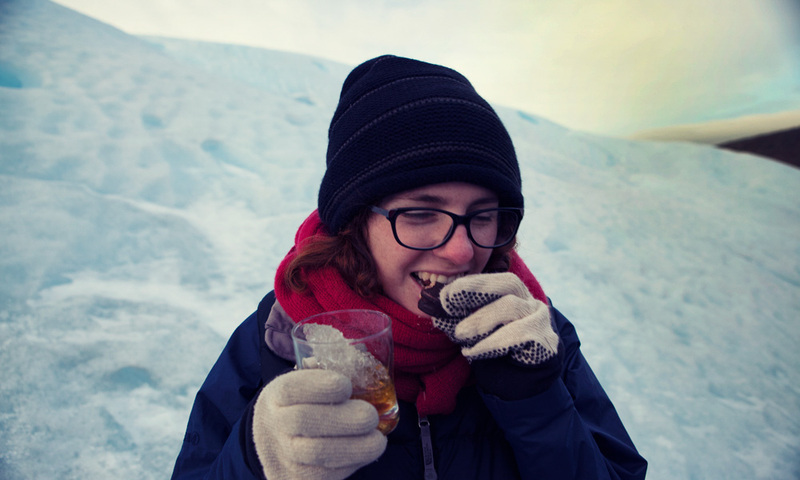 At the end of the trip, we were given a celebratory drink of Famous Grouse on glacier ice, and an alfajor. 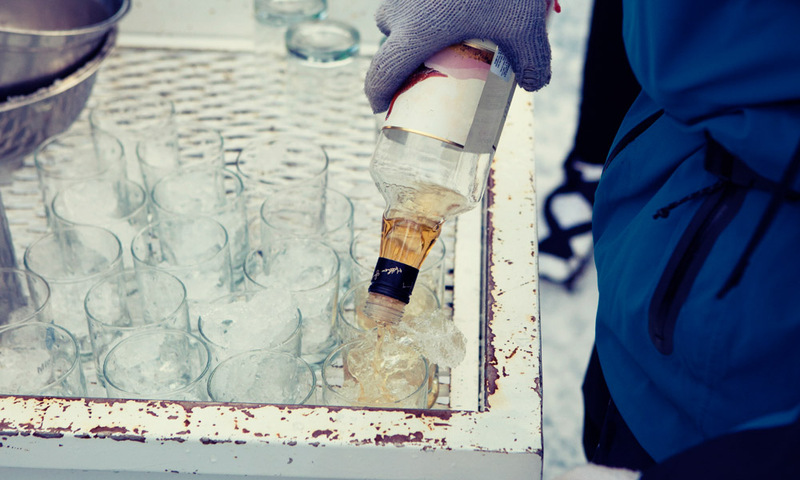 It was the best whiskey we ever tasted. 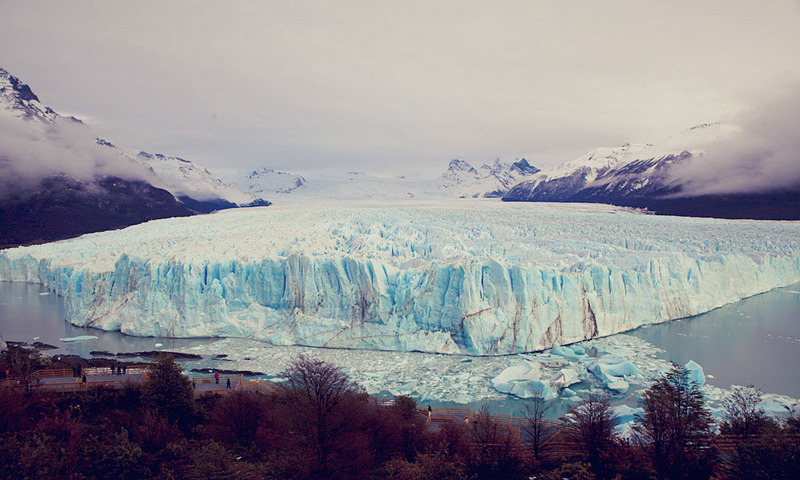 In our opinion, Perito Moreno should be one of the wonders of the world. It’s one of the most incredible, humbling sights we have ever seen, and its majesty captivated us more than we could have imagined. It certainly deserved an ‘excellent splendour of the universe’ moment. 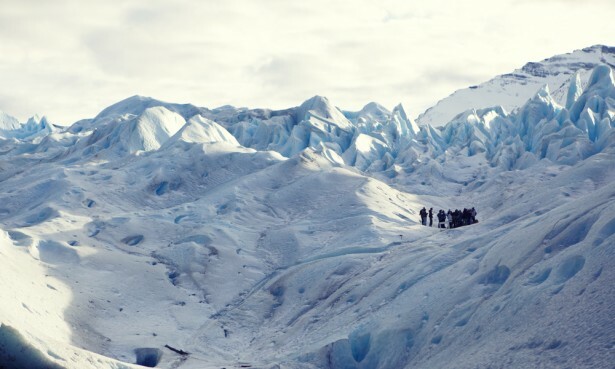 We went to Perito Moreno at the end of May with Hielo y Aventura, and we stayed in El Calafte at Hospedaje Lautaro, which was a beautifully homey hostel with two of the most friendly owners we have ever come across. Belen even leant me her snow boots. It’s the perfect base for visiting the surrounding area. Thanks Diana. It was one of the most beautiful things we’ve ever seen. 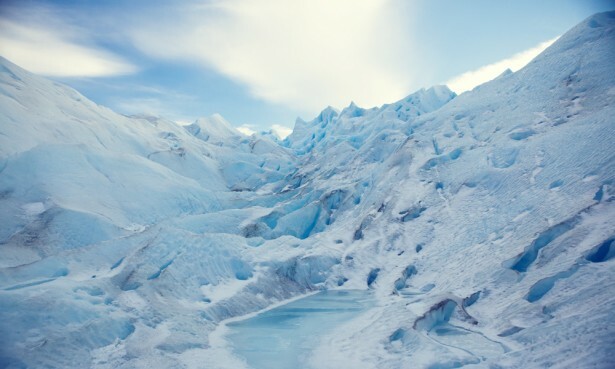 Although I’m sure the glacier was pretty photogenic in itself, these photos are stunning! I am very jealous…. Thanks Ellie. I want to see your pictures of Senegal! 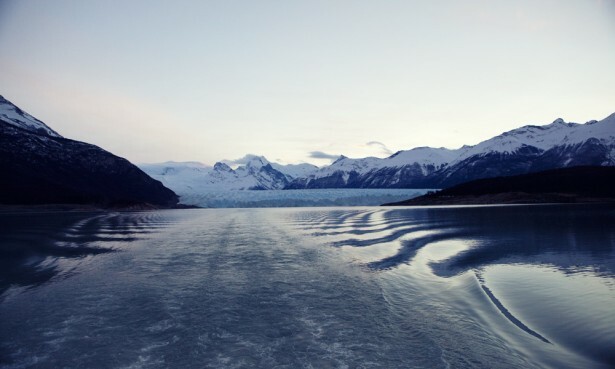 Your photos are breathtaking and more than do the natural beauty of the glacier justice. 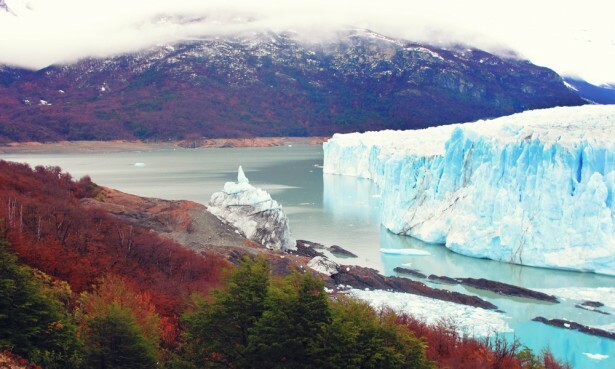 I particularly love the shot of the icy blue of the glacier mirrored by the warm autumnal hues of the trees. I can’t wait to visit Perito Moreno myself – if only for the Famous Grouse on glacier ice! Thanks Hannah! I’m particularly pleased because you chose the only photo taken by me. Hehe. Really it’s Steve who takes the excellent photos – I just have my moments. Thanks again, and I hope you get to visit the glacier one day. It really is spectacular. Do it! 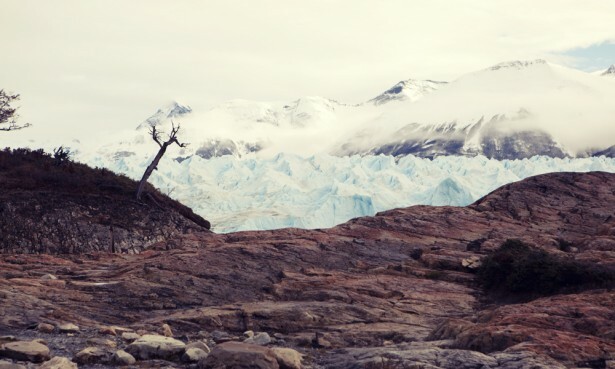 A visit to Patagonia is certainly worth it. Hope you get there. And thank you. 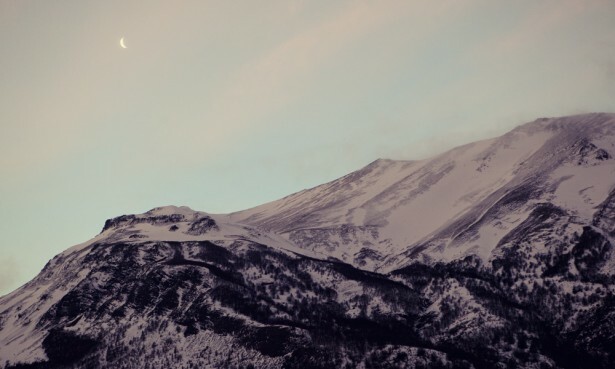 I just discovered your blog and I’m loving it! 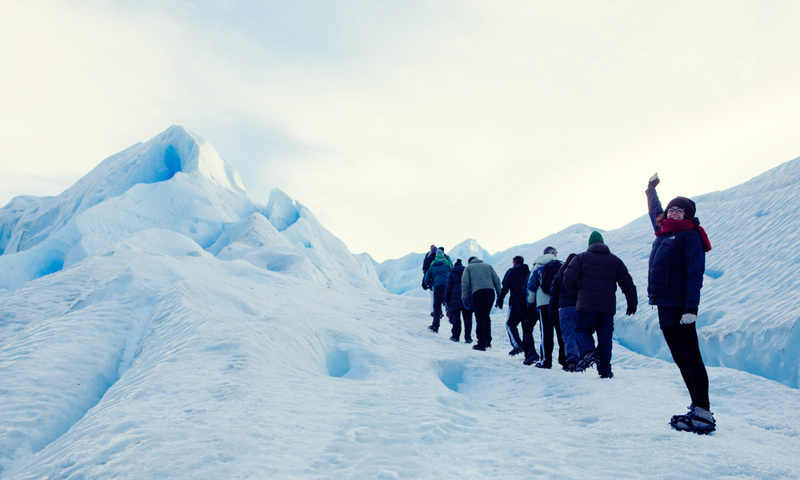 We did the same glacier trek of Perito Mereno Glacier and loved every minute of it. 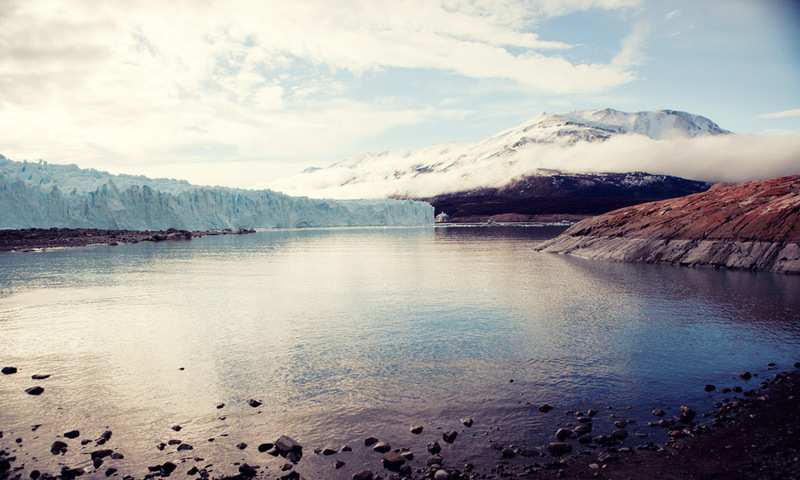 The sound of the glacier crackling and falling into the water was amazing, right? We could have sat and listened to that for hours! And we stayed at the same hostel, too. What an amazing place! Exactly! It’s the kind of place I want to go back to just to hear the sound again! So awesome!! We are doing this early next year – and I’d planned to book with Hielo y Aventura so I’m glad to hear that it was a great trip. I’m thinking of going there myself around the beginning of June, and i was just wondering if you think its worth a visit in the winter months? I’ve been doing some research and some people are saying go for it whilst others are saying going around autumn time.